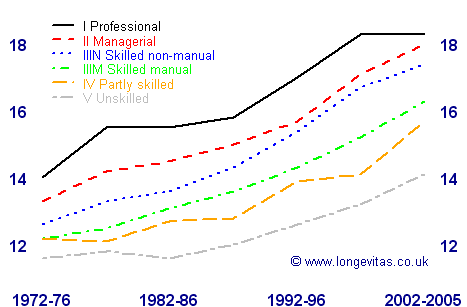 Socio-economic differentials have proved very durable in the UK over the past thirty years. While all socio-economic groups have enjoyed substantial increases in life expectancy in retirement, the gap between the top and bottom classes appears to have widened over the last thiry years. The above chart shows that it costs more to provide pensions to people in higher socio-economic groups, so life insurers need to charge them more for annuities and pension schemes need to hold larger reserves for their pensions. The drawback of socio-economic group as defined by the ONS Study is that it is determined by occupation. This is a semi-subjective categorisation, which is prone to misclassification or exaggeration, is hard to verify, and is seldom available for existing annuitants of life insurers. What actuaries need for underwriting social group is simple data that reliably predicts higher or lower mortality. Walking down a street will usually give quite a good impression of the socioeconomic status of the people who live there. Very broadly, a postcode covers a single street (or less) in the UK, so postcodes should be useful potential indicators of socio-economic status. So how can we apply postcodes to derive a good proxy for lifestyle? The answer lies in geodemographics, which is the process of profiling an address or postcode for social status. 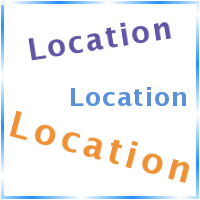 Longevitas has integrated processes which will automatically profile postcodes from the UK, Canada or the Netherlands (or zip codes in the USA). You can choose any profiler you like, and you can switch between them at will. Geodemographic profiling datasets such as Experian's Mosaic, CACI's Acorn and Eurodirect's Cameo have long been used to segment consumer populations for marketing purposes. But do they have uses beyond marketing?